A headgear stabilizing and ventilating apparatus comprises a flexible material having attachment means provided on a first side thereof and a plurality of resilient flexible spacing means provided in a second side thereof. The length of the flexible material enables the apparatus to be positioned within a brim portion of an article of headgear enabling the spacing means to engage the user head, stopping the hat or hardhat from slipping sliding or blowing off in the wind or when bending down. secures all types of head wear, no competition. The benefits to both products HATRIX for hats, caps,visors & SAFE-MATE for all industrial Safety helmets. 1 Stops headgear from falling of when bending over. 10 Keeps your hat clean. I would be seeking an outright sale, or lump sum with royalties. The market has potential to reach most house holds as well as the industrial safety helmet sector. A professional Market research was conducted on this new product, by a renowned university, they tested the market with a proto type only and determined that there was a market for Hatrix. there suggestion was to survey the market with the finished product for a more accurate result, but the proto type gave me the answers I needed to continue. Two products under the one patent. Trade marked as Safe-Mate for all types of Industrial Hard Hats. please read the testimonial on this site. the amount I am seeking is $60.000 + a $0.50 royalty or nearest offer for a full purchase of both products....Make a realistic offer. Please no time wasters. Both products cost 80 cents to manufacture and both retail for $12.00 USA. I find customers that love the Hatrix purchase additional 2 to 4 units for other hats or family members. Check out my unprofessional demo on my web site. 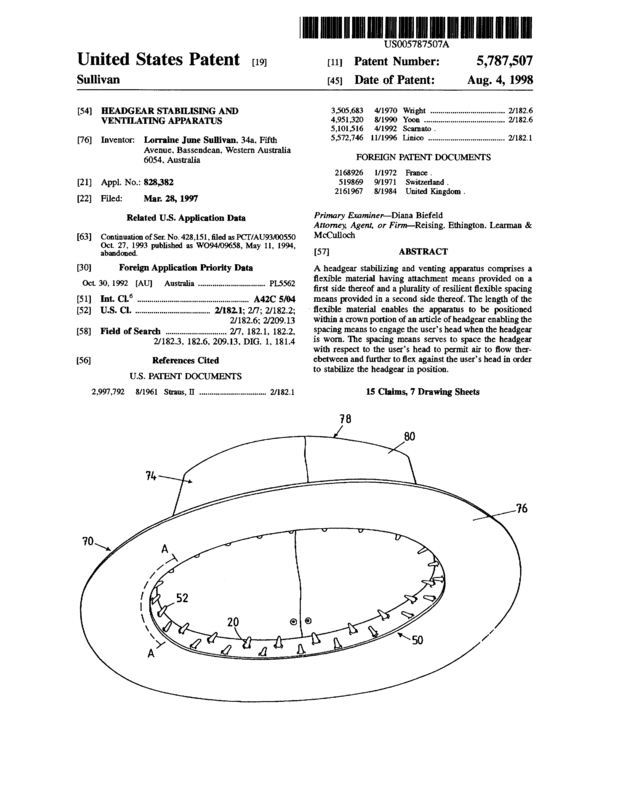 Page created at 2019-04-25 17:59:04, Patent Auction Time.